Heeft u een vraag voor Crown Diamond Hotel Phu My Hung District 7? Crown Diamond Hotel Phu My Hung District 7 in District 7, Ho Chi Minh Stad is een populaire keuze onder reizigers. Op slechts 13 km afstand, kan dit 2-sterren hotel eenvoudig worden bereikt vanaf het vliegveld. Dankzij de praktische locatie liggen alle belangrijke trekpleisters in de buurt van het hotel. Bij het Crown Diamond Hotel Phu My Hung District 7 staan de excellente dienstverlening en superieure faciliteiten garant voor een onvergetelijk verblijf. Het hotel biedt gratis wi-fi in alle kamers, 24-uur receptie, snel in- en uitchecken, bagageopslag, wi-fi in openbare ruimtes om gasten een maximaal comfort te garanderen. Alle accommodaties beschikken over doordachte voorzieningen om een ongeëvenaard gevoel van comfort te garanderen. De recreatieve faciliteiten van het hotel, inclusief golfbaan (binnen 3 km) , tuin, zijn ontworpen voor maximale ontspanning en onthaasting. 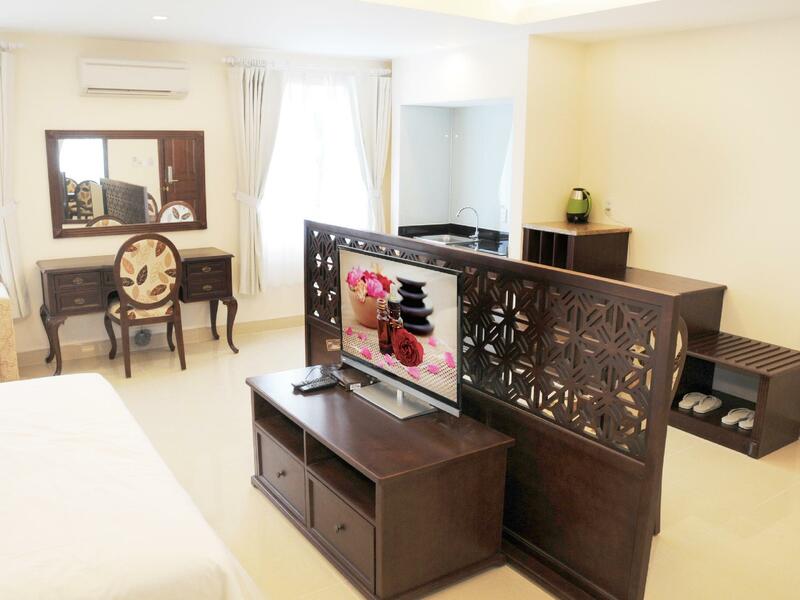 Fantastische faciliteiten en een uitstekende locatie maken het Crown Diamond Hotel Phu My Hung District 7 de perfecte uitvalsbasis om van uw verblijf in Ho Chi Minh Stad te genieten. Unpleasent experiences due to mosquitos in the room, the corrior and the restaurant. I have to spray the mosquito repellent to the bed. The room was small, especially the shower booth, deteriorating, and needy of maintenance. The friger, the safe box is on the floor, making it difficult to use. The hotel provides choices of breakfast and it was very acceptable, though. Would not recommend the room I have stayed. We requested for a room with bathtub, and there’s only one standard room with a bathtub located in their basement. Front office staff allowed us to check the room first,whether or not it is to our liking,before checking us in. Surprisingly,the room was very spacious and clean,it was more like a suite hidden in the basement. Breakfast was also impressive. many Korea foods around this areas. Walking distance to shopping mall (VivoCity) with lots of modern shopping and supermarket and cold storage for all your needs. Grab is very largely used if you will to go further exploration. Good staff and morning breakfast will serve according to choose from the menu, (not buffet type). Simple and easy hotel to stay for short time. It is quiet and peaceful place . You don't have to hear the noise from motor bike or something like that. Staff are friendly and rooms are clean. Everything is good enough except distance from air port. It is not close from the air port. I stayed in one of the largest rooms and was impressed with the size. Unfortunately I was sick while there, but it was a nice place to recover. Clean rooms, and the staff were really nice. Booked extra nights! This is the first time I've stayed in this are and found the hotel was well positioned and the staff are friendly. I must admit, having not been here before, it was difficult to find so make sure you take a copy of the map with you before you arrive, or make sure you have data on your phone so you can look at the map. I had good three nights staying in this hotel, the room was very clean & comfort. I definitely will stay in this hotel again if I go to HCM. The staffs speak well English, the only negative feedback I have is, the wifi internet speed trend to be very slow at night (i guess many users were using at night). Room is big and clean...Tclean...The breakfast is soso..
Good food outlets and security Guards patrol the roads at night. Many Koreans food and bakery. Local food available. Good location. I have stayed here many times and often found it a pleasure to return, and the same problems remain from previous stays. Basically the room is quite ok and value for money, but tiny things like lousy soaps, lousy furnitures etc spoil it. The room key also did not work well. It's location is not bad - a number of eateries around them but there is enough distance not to cause noise. The room outside though was a little squeezed. The workers at neighbouring sites start work at 7am, so late-wakers beware. Pros Near to shopping. Hotel staff can speak English. Cons it says it is a non smoking hotel but you can smell it in your room because the smell come in from the corridor so basically your whole room smell of cigarette. Many mosquitos in the room, killed 3 and 2 still flying around. Even during breakfast, there are many mosquitos flying around. I don't not know why the management do not want to do something with it. We loved district 7!! !It cost time and money to get there from all the major attractions mostly in Dis 1 but the place is so clean, quiet, spacious and calmer than the buzzing Dis 1. The hotel was great too with many restaurants and joints nearby. The staff was super helpful. We had one of the best breakfast in Vietnam with an amazing Pho in the morning and yummy coffee or green tea. It was our first stop and it takes some time to get used to the country's habits. 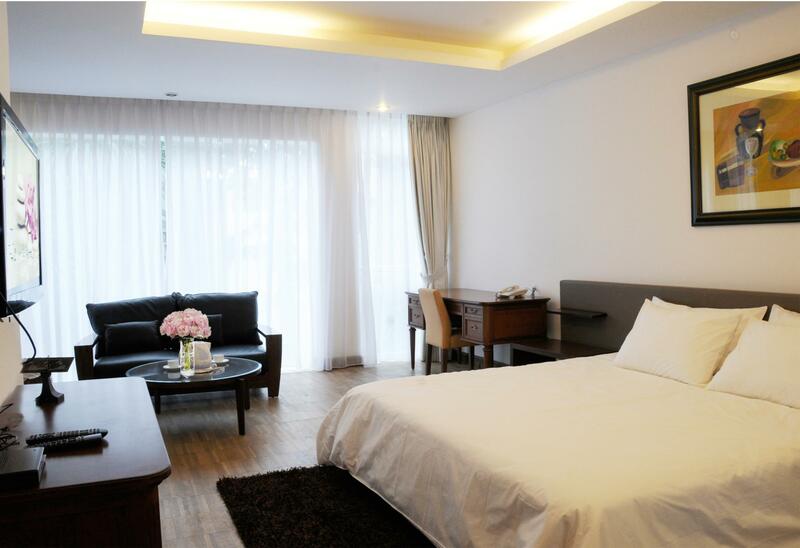 And Crown Diamond is the best with big clean rooms and very nice staffs. 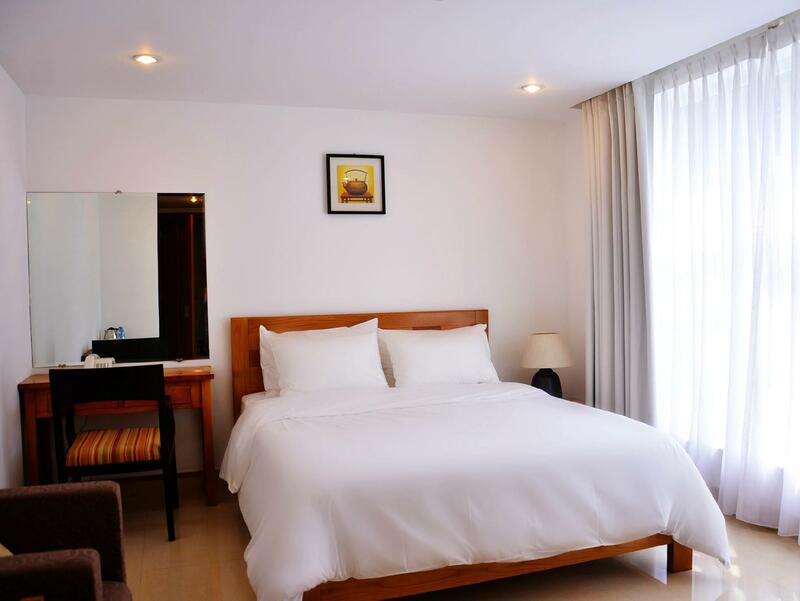 Very clean hotel with a nice cafe on the ground floor suitable for business meetings. Very fast wifi and nice breakfast makes this hotel a comfortable one to stay in for a few days. Lots of korean food nearby and there's even a supermarket around 50meters away. The staff will help you call a taxi or a grab/uber for you and they speak english very well. I had a good stay in late December and when I saw an offer that was slightly cheaper than the room in December, I decided to choose that offer. I found out I was given an attic room at the top floor. There is no lift up to the 5th floor since the lift stops at the 4th. You have to climb the stairs to the top floor. If they had said so clearly then maybe I would not have chosen it. Perhaps every person has a different preference for bedding but this one is unusually soft. I think I had a backache after one night - plus the pillow was quite high and therefore my neck was not comfortable as well. Shower facilities were poor. Water was either too hot or too cold because it was difficult to adjust to a good balance. The shower head had no stand to hand on to and one had to hold the shower head to shower. The hotel's location was actually nice. We thought it was going to be far away from everything given that it is in District 7, but everything was pretty much accessible for us. It was what they called "Korean Town" for it is packed with Koreans, visiting and living there. The room was cozy and nice. The staff service was very good. Our receptionist was very helpful. His English was really good. The food was decent as well. Overall, we had a good stay at Crown Diamond Hotel. Totally recommended! We go Ho Chi Minh city several time but this is the first time we choose to stay in District 7. Crown Diamond looks like a new hotel as furniture in room looks new. Room is clean and bed is comfortable. Nothing to complain, will return to stay again in future. I've stayed in this hotel for 2 times with good memory, but this time, they arranged me in a mezzanine room of 5th floor. The room is acceptable, but I think the price is not reasonable if they arranged this type of standard room for me. Of course I would like to stay in this hotel again, but I'll not take the risk to choose the cheapest standard room again. The room is so narrow, not enough space for luggage. Front desk staff is las way not available to attend guest. The only exception is the cafeterias is so nice and offer good drink and food. This hotel is quite nearby many Korean restuarants.